I spent a few hours painting last night and for the first time in a while, was really happy with my end result. I always enjoy the process of painting, but it’s soooo nice to have something turn out the way you imagined it in your head. 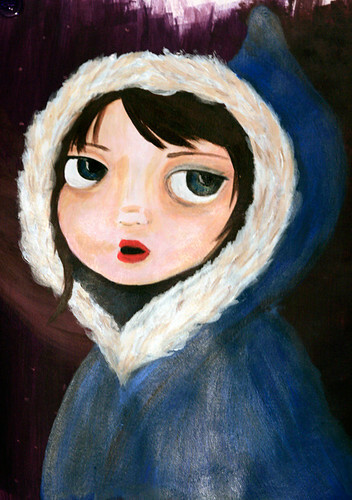 For this little winter girl, I used Emily Martin for inspiration and a BIG piece of paper that I’d painted a random night scene on months ago while trying to finish up some of the purples and reds I’d mixed on my palette for an art class project. I hate wasting leftover paint, so I whipped this up, nothing I spent a lot of time on or particularly liked, but it worked great for a pre-painted background. My process was a little different this time since the background was already so dark. I knew normal graphite pencils weren’t going to work for my sketch, so I pulled out a light shade of watercolor pencil that worked an absolute treat! Don’t like a line? Dab it out with a wet paintbrush. Easy peasy! I wanted to go slowly this time too building up the skin tone with many, many, many (seriously, probably 30) layers of glaze. I’d go a little pinker, then a little more yellow, then a little whiter…lots of depth. I really liked the way that worked, but next time I’d start with a pretty thick acrylic base just to get really going over that dark purple. The whites of the eyes took ages too, so I think I’ll probably paint out the face in a light flesh tone, let it dry, then go back in and sketch out the eyes, mouth etc. Overall I’m really happy with it and I’m mostly attributing that to going slowly with the glaze (gel), but I also have to wonder if just painting on a bigger scale was what did the trick. The scrunchy-faced painting I complained about before was teeny tiny – 8 inches high with the girl’s face only 2 inches wide. Maybe I was getting frustrated simply because I was trying to DO too much in such a small space. Leave the detail for the bigger works!